Mother’s Day really is all about breakfast. Breakfast in bed, late breakfast, breakfast at a local diner, or breakfast all day long. I’ve really enjoyed making things with yeast lately, so I’m super happy the sour cream breakfast buns won the poll. The sour cream gives the breakfast buns the most beeeeeeeeeeautiful texture I have ever seen inside a cinnamon bun. Kinda makes me wish I had taken a picture of a sliced bun, but oh well. I found the recipe on a website called Diana's Desserts. The recipe comes from Marie Beesley, who's been a farm wife for 53 years. I'm guessing in all those years it has been tweaked to perfection because these breakfast buns tasted Amazing!! Rating 5 out of 5. - Grease twelve 2 ½ -inch muffin cups, set aside. On a lightly floured surface, roll dough into an 18 x 12-inch rectangle; spread with softened butter. Combine brown sugar and cinnamon; sprinkle evenly over dough. Roll up, starting from a long side; seal seam. Slice into twelve 1 ½ -inch-wide pieces. Place each bun, cut side down, in a prepared muffin cup. - Cover and let rise in a warm place until ¼ to ½ inch above top of cups (about 45 minutes). Bake in a 400°F (200°C) oven about 15 minutes or until golden brown. Remove buns from pan. - Combine confectioners' sugar with a teaspoon sour cream, and enough milk to make an icing, of drizzling consistency; drizzle over rolls. Serve warm. Mmmm this is what I want for my saturday breakfast!! These look great -- love the sour cream icing! 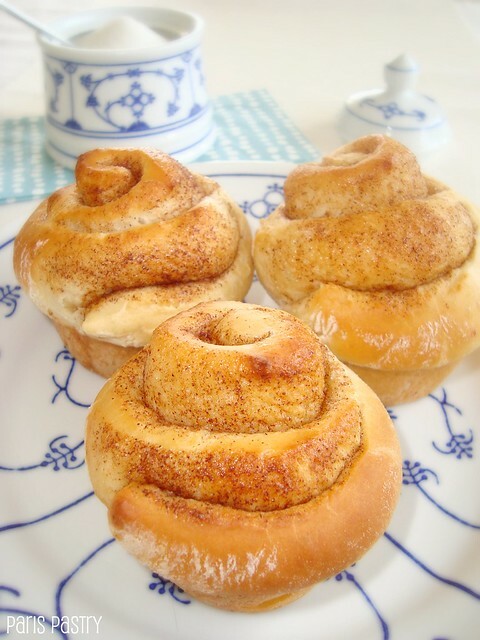 These look really good, soft and squidgy is great for a cinammon bun! Oh my word. These look fabulous!!! 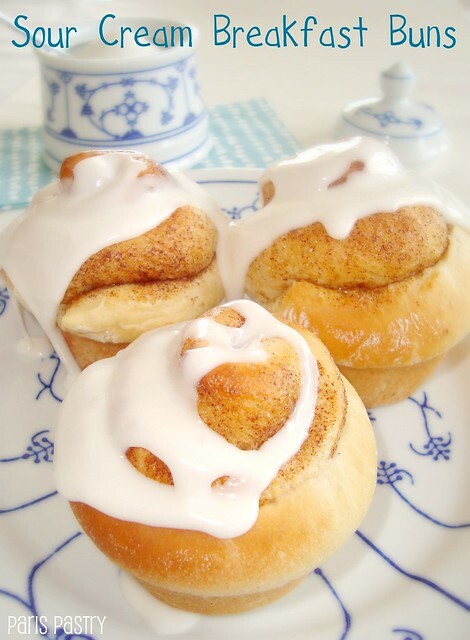 Love cinnamon buns, these look light, moist and scrumptious! Just a few notes: I halved the recipe, although the dough still spread out to a fairly wide rectangle. I did initial rise for about an hour after mixing the dough, then I formed and let them rise overnight in the fridge. I also added a chopped up apple to the filling, and I put them in one dish (not muffin cups). Worked out great - wonderful texture and flavor, although the icing was a bit too sweet for me .